As someone who gives a somewhat greater credibility to polls than many, I was not among those of the true faith who never doubted that Labour would do well, and indeed was, until late April, in despair as polls had consistently for about five months indicated a Tory landslide, for which the poor local election results on May 4th were a harbinger. But then the first of many rules was broken (Polls do not move much during campaigns). They moved enormously during the last four weeks, so that on the eve of the election they indicated that May would not do much better than before and that Labour would get about 35%, better than Miliband or Brown and as good as Blair in 2005, thus consolidating Corbyn’s position. As it was we did better than that, mainly because younger people significantly increased their vote, predicted by only a minority of pollsters. But those of the true faith on the Labour right refused to accept, despite these polls, that the result would be anything but disastrous, as Corbyn had breached Blair Rule One (Labour must always pitch to the Blair-defined centre). In an excellent article in Prospect Steve Richards rubbishes the Blairite notion of the centre, which Labour’s new priorities, as spelt out in its manifesto, seem to have successfully replaced. I should however say that the accusation by some on the left that officials were refusing to redirect resources to Tory marginals that Labour might win is somewhat unfair. At the beginning of the campaign it was quite right to adopt a defensive strategy, and it was only in the last two weeks that the position was reversed, although some officials clearly refused to recognise that. But it wasn’t clear cut, and we did lose seats to the Tories. But what was amazing about the result was the apparent paradoxes that it threw up. Despite rightly regarded as having failed, May’s election saw the biggest Tory vote as a percentage of those who voted since 1983. Indeed for Labour, if you count the 2001 result as the same (it was 0.7% higher) it was, apart from 1997, the best result since 1970! Those over 55 and the working class, defined as groups C2, D and E, actually swung to the Tories. Labour did as well as it did through the votes of those under 45 and the middle classes, defined as groups A, B and C1. But clearly the election was in part about Brexit, which helps to explain working class and older voters’ ‘Leave’ support for the Tories, and middle class and younger voters ‘Remain’ support for Labour, although not opposing the leave decision enabled some previous UKIP voters to switch back to Labour and existing Labour Leave voters to remain with Labour. Given May’s previous popularity it is understandable that that she was seen as the key to the Tory campaign, but she was obviously unsuitable for fronting a campaign unless she was kept at a distance, a tactic that only made her seem robotic and frightened of debate. Her policy contortions over social care only made things worse. Corbyn, by contrast, appeared statesmanlike and with gravitas, particularly in his responses to the terrorist attacks. The Tory campaign was nowhere more inept than in their failure to cost their manifesto, meaning that they were in no position to question Labour’s manifesto. And it was clear that social media played an important part, which needs researching more. Labour certainly had more bodies on the ground canvassing, and Momentum would appear to have played a useful role here, but there was little sign of mass participation by the hugely increased and pro-Corbyn membership. So where does Labour head now. It seems almost unbelievable, but two polls are predicting what would probably be a Labour victory at another general election, and with the instability of both May’s position and that of the coalition, particularly regarding the Brexit negotiations, we must obviously remain on election alert. (And decide what we would do in the event of a run on the pound following a Labour victory). There are a number of issues that need consideration. Brexit is arguably the most urgent, as it becomes increasingly clear that remaining within the single market is likely to be the only acceptable form of soft Brexit, and that any attempt to promote a hard ‘left’ Brexit will divide the party, the majority of whose members and supporters are Remainers, and even in the unlikely event of being carried would end any prospect of winning an election, apart from such a policy being bound to fail anyway. I think it is likely that we will end up not leaving the EU, with a further referendum confirming that, as the consequences of a hard Brexit become increasingly apparent, but until then we should respect the decision to leave, which has helped to boost our vote. On policy development generally it is not clear, to me at least, where we are. Clearly, in the light of a likely election soon the manifesto must be sustained in its present form, although hopefully refined and deepened, with background papers elaborating on some areas. I am bound to say that I was pleasantly surprised at the manifesto, given the absence of much policy development in the preceding two years, but although its general pitch was right and in tune with the mood that delivered labour its vote, it remains ragged and undeveloped, and much work needs to go into a Mark 2 for conference. At the same time we are in the middle of the second year of the rolling development through the Policy Commissions, and these two have to somehow be married up. There are many policy areas that need development, but it is crucial, in the light of the Tory proposal and withdrawal on social care, that Labour comes up with a credible policy on this. It would be a mistake to risk division at conference by reintroducing the Trident debate this year. However, we should certainly beef up our proposals on the disarmament initiatives we are committed to. 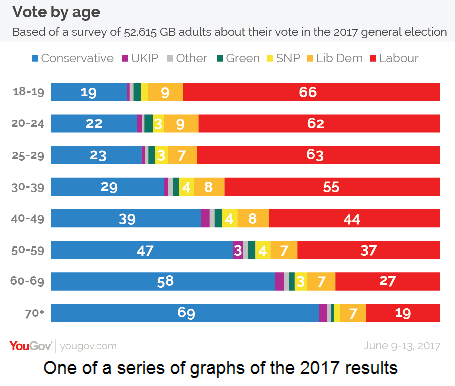 The voting support for the Tories by older people, although in part reflecting Brexit, is completely unjustifiable, and we should launch a major campaign aimed at winning back their support. Finally, we must prevent the divisions within the party that would be engendered by deselections in significant numbers. That is not to say that none should take place, but those who wish to rid the PLP of all MPs who voted no confidence in JC last year are saying goodbye to any hope of winning an election in the near future. The election has changed things fundamentally. The left has completely won on the issue of electability, both in terms of policy and JC as leader. Much humble pie has been eaten. There has been no echo of the ridiculous comments from Chris Leslie. Many MPs will want to play their part in something they thought couldn’t happen. They should be welcomed back. For those that can’t, well, Labour remains a ‘broad church’, but it must be made quite clear that the levels of abuse of the leadership perpetrated by some over the last two years can no longer be tolerated. A related issue is the normal trigger ballot reselection, but also selection in seats not held, as in all cases these were imposed by the NEC, and CLPs must be given a chance to run proper selections for them. It is now probably too late to attempt this before conference, but it should take place over the winter. Posted in: Activism, Brexit, Labour, Politics, Westminster. On the issues of the class composition of the vote, the typically used groups are not massively informative. For a start, most pensioners are placed in E. Independent tradesmen (petit bourgeois, to be a bit old-fashioned about it) are in the lower half of the groups, while clerical workers are in the upper half. They align more with a cultural conception of class than with one based on economic relations, as would typically be used by the left. Another interesting link is this one explaining how Yougov’s newer and more successful model worked. As someone who is quite interested in computing and data analysis I found intriguing. It is a very different approach from conventional polling, but it provided quite an accurate projection of seats. I won’t rehash all of Peter’s and my disagreements over what Labour’s stance towards the EU should be. I will emphasise, however, that even though Labour may need to be willing to accept Single Market membership that should not be its opening position. We should go in seeking something like the Swiss model (or potentially some sort of EFTA membership which sees only free trade in goods and not in services). Ideally what we are looking for is an agreement which allows the UK to get out of the liberalisation directives and the requirement for free movement of capital. Given that the EU can be a petty, vindictive organisation, they may well not agree to any of this (especially on capital movement) but Labour should at least try to hold out for it. If we can’t get those exceptions, then Labour should ignore those directives which would prevent it from implementing a left-wing manifesto (perhaps softening its policies slightly so that they are not in blatant violation) and dare the EU to do something about it. During this time, it should also be developing the capacity to be able to reshape the economy to survive without free trade with the EU, in case relations do break down. On social classification, absolutely, the problem is that while there was general agreement on the inadequacy of this system a long time ago -30 years? – it has for some reason continued to be used. Yes, the YouGov model (and Survation) worked, let us hope this heralds an improvement in polling accuracy. Your points on the manifesto bear out my view that much work needs to be done on a Mark 2 for conference. We will not be let off the hook so lightly in future. On the EU agreed we should have a flexible stating point, and we may well have to go down the road you suggest, but I am rather pessimistic about that, as you know. No, 30.5% in 2015, I do not otherwise understand your reasoning. Labour’s vote in this year’s election, in numerical terms, was 2.15 million more than the vote received by Blair in 2001, and also 0.6 million more than Wilson got in 1970. Only 1997, 1966, 1951 and 1950 beat Corbyn for numbers. I totally disagree. It is a huge cost for what is nothing more than a status symbol. And it puts us all at risk. If Labour were to change its policy on this, it could well prompt a re-think in the Conservative Party. An informative and interesting piece. This election was extraordinary and it will take time to understand what happened. It seems to be a return to two-party politics, but is that right? It would contradict a long-term historical trend towards fragmentation. Why did the over-47s swing to the right despite the Tory gaffs on old people? How much did Labour’s ambivalence on the EU worj to its advantage? There is much to analyse and discuss. I think that Peter is right to indicate the problem of the inadequacy of Labour’s policy process. It is, in its current form, totally unfit for purpose. The answer from many on the left is to scrap it and return to pre-Blair grand slam conference votes to determine policy. This reaction, while understandable, is in my view without any serious basis (i.e. it is completely stupid). What we need is detailed papers to be drawn up for debate, not the ridiculously thin stuff leaving mist substantial issue out of the frame. Where substantial differences exist the different views should be fairly presented so that members can think about them. In the two years of his leadership Jeremy Corbyn has failed to deliver in hus promise to put members in charge of policy. Now, with his position much strengthened by the general election he must move and move quickly on this issue. If he does not then it will be a failure of historic proportions and will ultimately bring him down. I agree with you that more work is needed on policy. Does anyone know what happened to the policy review? It got interrupted by the election and seems to be completely off the agenda now. You are, of course, correct that Corbyn has failed to deliver on putting members in charge of policy. Whether this is down to control-freakery or it simply got forgotten about in the face of more immediate challenges, I don’t know. However, his post-election response does not look encouraging in this regard. There are some decent rule changes set to come before conference, but none seem to relate to policy formation. Meanwhile, the focus of the party is continued campaigning as though there were an election on. While there are worse things we could do, this will not build power in communities or contribute towards improving party policy. At this point, we need to seriously ask ourselves what the membership could do to try to force the issue. Could we draft a rule-change to take to a future conference? As a relative newcomer to the party I’m not fully versed in how this process works. This would also require us to think about what a democratic policy structure would actually look like; I can’t say I know. To succeed we would need party members to actually be interested in this issue and I’ve seen mixed things in this regard. There was certainly a desire for more policy formation in my branch in the meeting a month prior to the election. A lot of people seem to consider the manifesto to be sufficient, however. Momentum Oxford has also talked about policy formation and a desire to push the manifesto leftward in some areas, but no one seems to have done anything on that. Despite Oxford having what I’d say is a fairly active and dynamic Momentum group, it’s primary focus seems to be on party recruitment and conventional campaigning. I’ve been thinking I might try to organise a series of meetings in my Momentum group to discuss policy. Perhaps we could link up with other Momentum groups where there is interest in doing this and eventually look to open it to party members at large? Ideally this would lead to some documents which could get the endorsement of Momentum locals and CLPs. Obviously this is no replacement for an official process, but it would bring the issue of policy to people’s attention, be good practice for if we ever actually get democratic control over policy, and might work to start pushing the leadership to do something on it. Thoughts? Peter, if we remain as members of the EU single market, and remain as members of the EU customs union and also agree to continue under the authority of the European Court of Justice (ECJ), then what exactly would we be leaving? What part of the EU would we actually be ‘exiting’ from?